This is certainly one of the lesser known regions of Namibia, but is truly a hidden gem! If you’re after something unexpected and slightly off the Namibian tourist track, then you should add this area to your itinerary. The vast Namib-Naukluft is a place of rugged mountains, endless gravel covered plains, deep gorges and tall red-orange dunes. 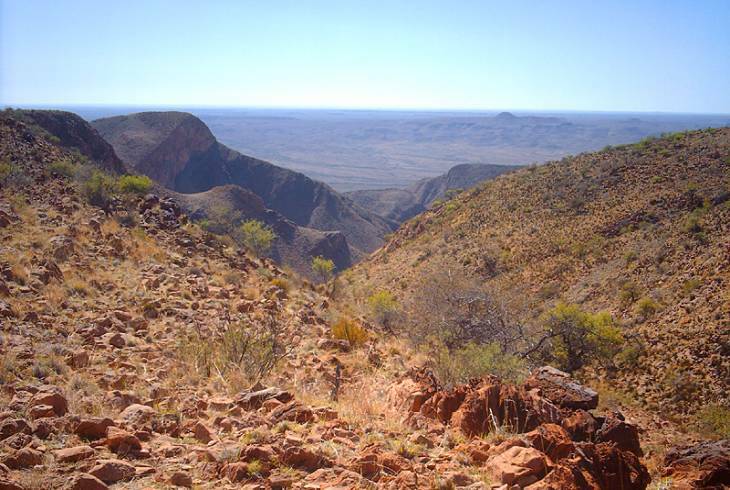 The Naukluft Mountains are part of the high rising escarpment which marks the western edge of the interior highlands of Namibia. The flat, plateau like top of the mountain complex is separated from the adjacent highland plateau to the south by impressive near vertical cliffs, while in the north west and west its highest peaks loom almost a thousand meters above the plains of the Namib. The climate is fairly pleasant although summer day temperatures can be extremely hot, winter days are pleasantly warm with temperatures averaging about 20 degrees Celsius. However, evenings are cool and temperatures of below freezing point are not uncommon at night. Most of the areas rainfall occurs between December and April as thunderstorms. The average for the area is about 200mm, but is extremely unpredictable. Naukluft was an obvious refuge to early man due to an abundance of water in an otherwise arid environment. Stone artifacts have provided evidence of the inhabitation of the Naukluft Mountains by Stone Age people. Other signs of former habitation include hides along game trails where animals were ambushed and rows of stakes driven into a rock face to reach beehives. The more recent history of the area has been recorded by the Germans who fought several bloody battles against the Witbooi Khoi Khoi. Reminders of these encounters include the grave of a German soldier just above the campsite at Naukluft, trenches and cannon sites. Sections of the route along which the Germans dragged their cannon onto the plateau are still visible a few kilometres south of the campsite. Over 50 mammal species have been recorded in the Naukluft area – the majority of these species are nocturnal or small, and so are easily overlooked. Nearly a third of these species are rodents, and the carnivores make up almost 20 percent. The Naukluft area was originally proclaimed as a sanctuary for the Hartmann's Mountain Zebra which, at first glance, appears similar to the southern sub-species, the Cape mountain zebra. More than 193 bird species have been recorded in the area, which makes this a birdwatcher’s paradise. Naukluft Mountain Region overview. Naukluft Mountain Region Accommodation and Information.